As readers of this blog know, Hollywood was once an independent city, culturally and politically distinct from Los Angeles. In fact, it was the anti-Los Angeles: religious, semi-rural and dry. From 1903 to 1910, Hollywood passed its own laws and collected its own revenues. It not only outlawed alcohol but forced Los Angeles to send liquor westward in a circuitous route around it. Life would have probably continued in that vein for a few more years if not for the matter of water. In an arid region, Hollywood’s survival depended on water from the California Aqueduct, then under construction. But the only way for Hollywood to tap into the Aqueduct was to become part of Los Angeles, so like a lot of other little towns, it did. Change came immediately. There was massive new development in the form of movie studios and houses for the new stars and moguls of that industry, and by 1920 Hollywood had surpassed downtown Los Angeles as an urban hub. Its glory days were shortened by the Great Depression, and over the decades Hollywood became a seedy and crime-ridden place. Despite various attempts at rejuvenation, things didn’t really turn around until a decade ago, with the completion of Hollywood and Highland in 2002. Since then, Hollywood has became not only a tourist destination but a kind of Nightlife Ground Zero for suburbanites from miles around, drawn here by restaurants, clubs, theater and concerts. Anyone attempting to drive through Hollywood on a weekend night can see the difference: streets that not so long ago were the nighttime domain of panhandlers, hookers and homeless people are now thronged with young women in tight dresses and stiletto heels and the men who want to meet them. Hollywood Boulevard, once so blighted that the average tourist spent only 20 daytime minutes there, is now vibrant, glittering and packed with pedestrians–and lots and lots of cars. Unfortunately, the major aspect of Hollywood that hasn’t changed is the streets–essentially the same ones laid out by Harvey and Daeida Wilcox in the 1890s. The exponential increase in traffic has overburdened them to the point where certain streets such as Franklin Avenue are now congested day and night. During rush hour, gridlock is common, and on Franklin drivers often jump the median line in an attempt to gain some advantage, terrifying the oncoming traffic. Given the evidence, it’s safe to assume that few of Hollywood’s visitors arrive by public transport, yet this is what Mayor Villaraigosa thinks will happen if a massive new project call Millennium Hollywood is built. 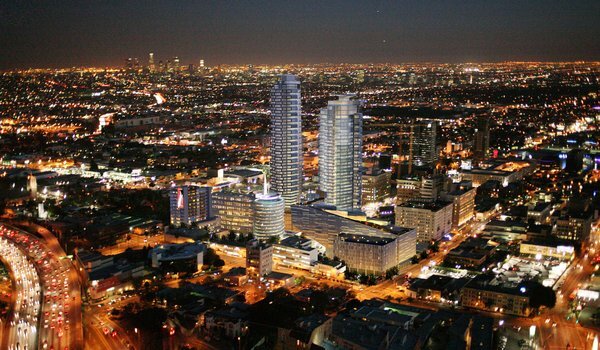 Occupying a large swath of land north of Hollywood and Vine, the development features two towers over 50 stories (dwarfing the current tallest building in Hollywood, at only 20 stories) as well as numerous other buildings. Where all the cars for the new residents and workers are supposed to go is anyone’s guess–certainly the developers and City Hall haven’t given it much thought. The objections of 40 neighborhood organizations have just been dismissed, and it seems obvious that some version of the scheme pictured above will be built. Of course there’s so much more to the story–including a clear conflict of interest at City Hall that uncannily mirrors one of a century ago. The more things change in Los Angeles, the more things stay the same: needless to say, I’ll be writing more about Millennium Hollywood and its antecedents in the future. In the meantime, I’m taking a couple of weeks off to do other, non-Hollywood things, and will be blogging again in mid-April. 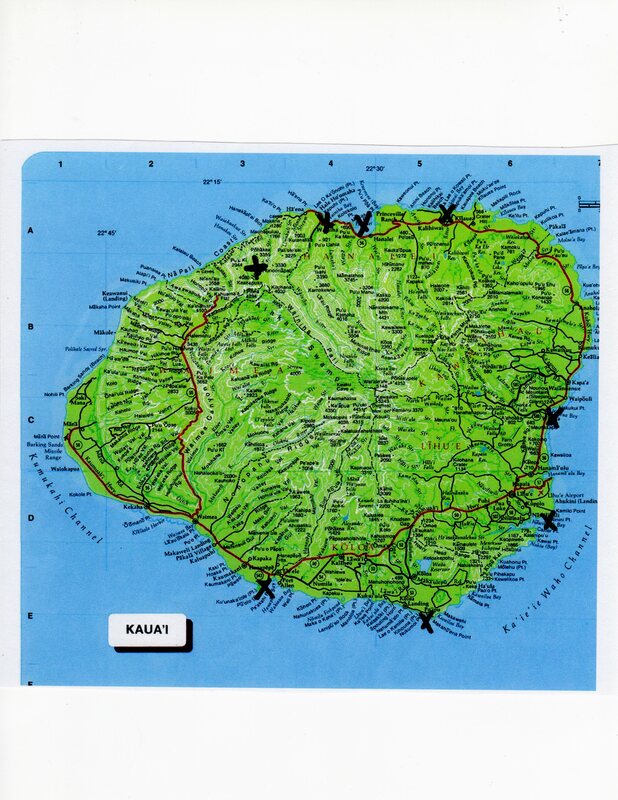 A map of Kauai. The sites of recent drownings are marked with X’s. Recently I visited Kaua’i, the island I consider my second home. Despite a lot of recent development on the South Shore, Kauai has retained its essential nature: rural, lush and mysterious, with a permanent population of less than 67,000. It is always a pleasure to return. Of the million visitors came to Kaua’i last year, many were day trippers off cruise ships, while most of the rest stuck mainly to the resorts.But among the more adventuresome, a few befell the accidental deaths for which Kaua’i is notorious: drowning after falling off rocks and cliffs, or after being swept out by rogue waves and rip tides. (It’s not only tourists who drown: the changeable waters that make Kaua’i one of the best surfing spots in the world regularly claim the lives of residents as well.) In 2012, two people drowned off Kaua’i. Then I learned about the other eight drownings (there has since been another). Heart attacks and other health issues seem to have played a role in about half, while three (all in the same place–Kalihiwai, on the North Shore) involved men who walked along the rocky coastline despite posted warnings and either slipped or were swept off by high surf. One drowning was a freak accident: when a sudden flash flood in the Hanakapiai Valley stranded fifty hikers and two rescue personnel, a tourist from New York was swept away by the rising water. In light of these tragedies, visitors should know that Kaua’i’s waters change seasonally: on the North Shore, the surf is high in the winter and low in the summer, while on the South Shore the situation is reversed. They should never turn their backs on waves, walk in restricted areas such as rocky coastlines, or swim at the mouth of a stream or river, all of which are likely to result in being swept away by waves or currents. Another precaution is one I didn’t know until fairly recently: swimmers should carefully observe the ocean before entering, avoiding places where the waves aren’t breaking parallel to the shore. Much as I like to think I’ve never had any problems while swimming off Kaua’i, I actually did have one when I was 8, while body surfing at Brennecke’s Beach in midsummer. The waves were big that day, and there was a current that sucked me down after a wave broke on my head. I was upside down in the swirling green water for what seemed like minutes. When I resurfaced, scared and gasping, I found my family strangely unconcerned. Of course they were aware of my habit of swimming underwater in our pool at home, but it was a close call, and one that might have ended differently if I had been less able and less lucky. As it happens, the most recent incident on Kauai ended as uneventfully as mine. On March 17th two men were swept out off ‘Anini Beach on the North Shore, but one made it back on his own, while the other got an assist from rescuers and reached the shore uninjured. They were lucky, but they also knew not to fight the current; instead, they let it carry them out and release them. Hollywoodland resident Martijn Veltman sent me this photo after seeing Tommy Dangcil’s postcard in the previous post. 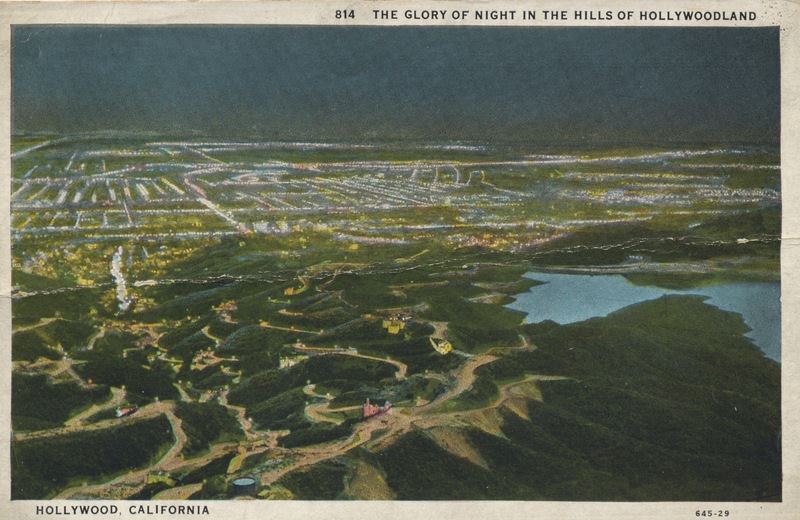 He found it in a book on S. H. Woodruff, Hollywoodland’s developer, and we both agree it’s the same image, though heavily painted in the postcard version. 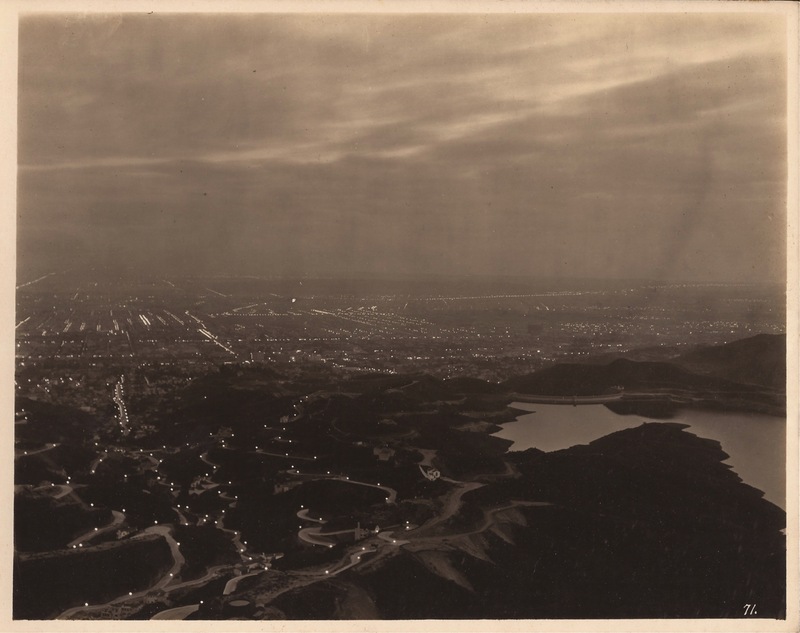 From Tommy Dangcil’s postcard collection comes this magnificent view of Hollywoodland and Lake Hollywood by night. Its date is obvious from the handful of houses sprinkling the hills: no later than 1925. At that point, Hollywoodland was just two years old, and what houses existed were newly built. In the coming decades, hundreds of new houses would spring up in Holllywoodland, but the contours of the land would remain the same. Also unchanged is Lake Hollywood, whose shape was determined by the canyon–Holly Canyon–that was flooded for its construction. You are currently viewing the archives for March, 2013 at Under the Hollywood Sign.